Educational Qualification : Passed LLB Degree and 3 Year Experience Lawyer/Advocate. Eligible Candidates can Submit Application at the Official Website of Jharkhand High Court latest by 15th Sept 2018. 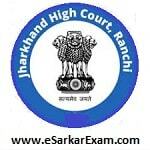 Applicants First Logon to Jharkhand High Court Official Website. Open Apply Online Link of Legal Assistant Recruitment. Now Open Legal Assistant Advertisement Link.